This post shares some of my thoughts on Uber, the app based on demand taxi service that is making news off late. I was holding back this post thinking it is not fair for me to write about it without even experiencing it once. My taxi needs are very seldom and few times when I tried, Uber was not available, hence I couldn't try them so far. So this post is purely based on information available in public domain. Once I experience their service, I will write another post. Uber fans may not like this post much, as it raises a few concerns. If I have written something wrong, I am willing to correct. Do comment. As you know, Uber is an app based taxi service, who have a fleet of luxury cars which arrive on demand and customers are charged to their credit card. To begin with, Uber is a western concept. In cities like New York or Singapore, taxis keep plying on the road empty all the time and if one goes to main street, one can hail a cab by waving their hand. Most of the time there will be one cab or the another, hence probability of not finding a cab on the street is very low. However, in India cabs don't keep plying empty. Only Auto rikshaws do that. Cabs are often stationed and await a booking call. People who need a cab usually book in advance to ensure that a cab will be available when they need it. Of course there are others, who will have ad hoc requirements. 1. I need to rely on my luck and can't book in advance. Most of my taxi requirements are for early morning/late evening airport drops. Before I go to bed I need an assurance that there'll be a taxi at specified time to pick me up. I usually call Fast Track, give a reporting time after factoring 30 min buffer for any delays, get a confirmation and go to sleep. When I wake up, I will have an SMS detailing driver details, which assures me that taxi is on its way. If I don't get an SMS or driver is far away, I will have some reaction time. With Uber, I can't book a car say 12 hours in advance. I need to wake up in the morning, try the app and check if cabs are available. It is all good if one is available. But what am I supposed to do if there're none? Scramble and call all taxi companies one by one desperately to check if they have a cab available like NOW? If not reschedule my flight to suit Uber black car's availability? It is this uncertainty that is preventing me from trying Uber time and again. Similarly I've read in some reviews that ETA may increase after booking confirmation- which is even worse when you have time bound tasks. 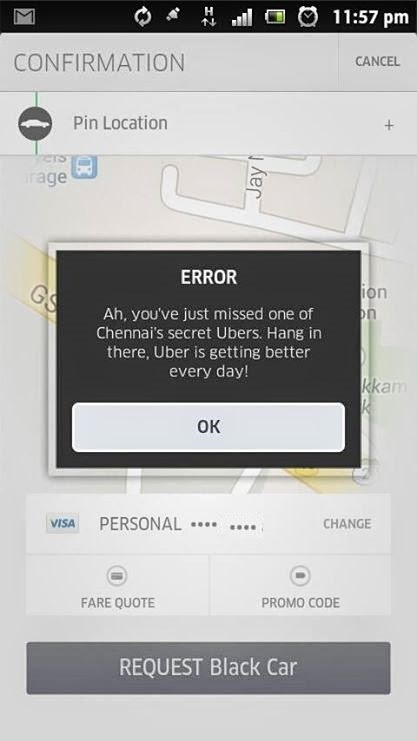 On the left you see a msg I got when I tried booking Uber at Koyambedu at about midnight, few months ago. Why is it a concern to let customers request a cab say 24 hours in advance and block a cab for them? Assume I need to go to Airport, some 50kms from city, early in the morning. Agree it is hypothetical situation and most of the time drivers drive at decent speed. Going too slow could cause the driver his next customer. Nevertheless, if I can't ask driver to go faster and driver decides to go super slow (because say he has no other rentals for rest of the day), I need to simply shut up and pay. 3. Same fare for all cars. While Uber promotes and tempts prospects with luxury car in its fleet, customer has no control which car he/she will get. You may be dreaming of BMW 7 series, but a corolla or an Innova might pull up. Fare is same for all cars, which I feel is not fair. Uber hasn't declared the breakup of their fleet- how many 3 series/C Class or 5 series/E Class they have vs the Innovas and Corollas. If Innovas and Corollas constitute only 10% of the fleet, then may be I will take my chance. But if it is other way round, my probability of getting a Merc or BMW will be very poor. This pricing model also encourages more and more ordinary cars in the fleet over time. I am assuming what Uber pays to driver/car owner is also on the same lines- owner of BMW and owner of Corolla get same amount. If this is the case, any fleet owner will find it practical to add 3-4 Corollas, instead of buying one 5 series car and earning one fourth the amount. Similarly, I may have 6 people, so may need a 7 seater. I may have to go an area which has bad roads where low ground clearance cars may not be ideal. If I can't give these inputs, there're chances I will not be happy with the ride. In lots of cities Uber has different prices for different categories of cars- for example, try Uber Boston https://www.uber.com/cities/boston. I feel they should introduce this rate structure in India as well. Of course above drawbacks are overshadowed by a fleet of luxury cars, interactive mobile apps, good amount of marketing, initial launch offers and other things. Uber's success has put traditional taxi operators on the backfoot. Steadily increasing fan base (in India) and one price revision already indicates that Uber is doing good and gaining popularity. So my best wishes to them. Uber is launching a budget version called Uber X [Details]. Of course competition among taxi companies are a good thing for Chennai people, where auto drivers readily quote more than Uber for any destination. Courteous drivers, clean cars and reliable service will soon get lots of loyal customers. Let me see when I can try Uber next. Very very true. With all other taxi services, you can request even 3 days in advance. And, you can request for a 7-seater. And, if you want to cancel your booking bcoz you got a lift from a friend, you dot get charged whereas in Uber, they immediately charge your credit card Rs. 200 I suppose. In Short, good company with stupid policies. You will get a free ride purely based on the driver. It doesn't matter if uber is giving u a free ride .After getting down, the driver demands that you pay the money. Then you have to mail uber to get the money reimbursed in the uber acct. Hmm, didn't know. Haven't tried any of their free ride offers yet..